Download a blank form to distribute to those who are not accessing the form below on-line. Optional: Add additional charities - funds divided equally between all of the charities selected (up to three). NOTE: Cards shipped to us cannot be returned under any circumstances. Please carefully check the list of which merchant cards can be converted into donations, before mailing. Identify Card Givers: Those who wish to identify names of participants - Card givers should record the merchant name and the last 4 digits of their card, so that the value of their donated cards can be identified and verified, when the host/leader receives an emailed list of cards back from us. all pertinent information, on an index card or secure paper. Place the paper into the host's collection box along with the physical cards OR donate individually online. Cards shipped to us cannot be returned, nor the charity changed under any circumstances. 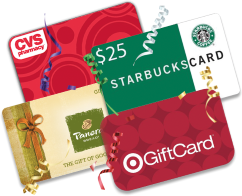 Please be sure to mark each gift card with the residual balance. and send it together with your package as a packing slip. You will receive an emailed receipt after the cards are totaled and balances are verified. (Usually 1 to 2 weeks after shipment arrives). Send your box/ package of cards, preferably with tracking.